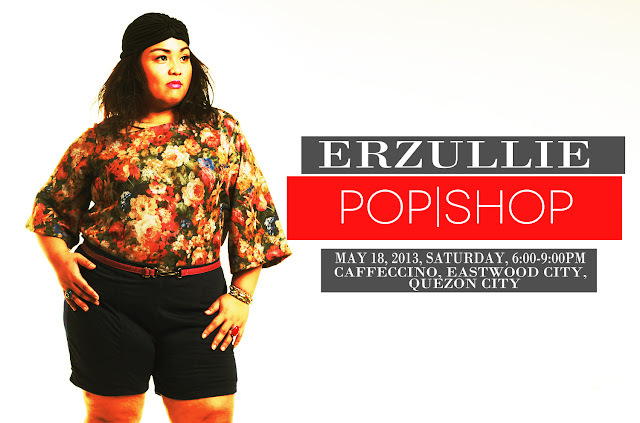 Erzullie Fierce Plus Size Fashion Philippines: PLUS SIZE FASHION: ERZULLIE MAY 2013 POP SHOP THIS WEEKEND! PLUS SIZE FASHION: ERZULLIE MAY 2013 POP SHOP THIS WEEKEND! It's a thrilling Tuesday, Erzulliestas! Well, for those who are feeling the blues, then here is something to brighten up your day. This weekend is the Erzullie Pop Shop! Remember to be there on May 18, 2013, Saturday (6:00-9:00pm) at the Caffeccino Function Room, Caffeccino, Eastwood City, Quezon City! Enjoy discounts, personal shopper service and of course, chatting with the designers! We are really looking forward to seeing all of you girls again!